Great Steak & Potato Company franchise business opportunity. Free Great Steak & Potato Company business franchise information. Since 1982, The Great Steak & Potato Company has been serving the finest Cheesesteak sandwiches in hundreds of locations throughout the U.S., Canada and abroad. Our recipe - freshness. We use the finest ingredients, prepared to order, to ensure the freshest, most delicious eating experience. The Great Steak & Potato Company's concept is a simple one. A "meat and potatoes" fast food operation that provides a unique visual, sensory and eating experience, with an emphasis on low cost and high value for the customer and a low operating cost and high return for the store. Chicken, Ham and Veggie "Philadelphia's"
At The Great Steak & Potato Company, we share a belief that every individual has the right to attain - and enjoy - his or her personal potential. We believe that the sky is the limit - and that there should be no barrier to reaching this limit. That's why we have made The Great Steak & Potato Company one of the easiest franchises to own - and operate - in all of retailing today. Opening a Great Steak & Potato restaurant is not new to us - we currently own and operate 20 restaurants ourselves. While each store is unique, we strive to make the process as easy as possible. We work with the franchisee to complete construction drawings, hire contractors and train employees. At no time do we leave your side. From planning to set-up to opening to ongoing store operation, we are there to assist you and keep you a productive member of The Great Steak & Potato Company team. The Great Steak & Potato Company not only has a tremendous, unparalleled success record, but also the proven experience only obtained from a system with hundreds of franchises already established. We invite you to learn more about The Great Steak & Potato Company franchise program and share the experience. 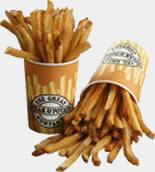 As one of the fastest growing franchising and marketing companies in North America, The Great Steak & Potato Company Restaurants are owned by the Kahala Corporation, a privately held corporation dedicated to the design, development and marketing of quick service restaurants. Kahala supports its franchisees by providing seasoned real estate guidance, ongoing operational support, and turnkey marketing programs designed to optimize profitability and boost register receipts. We are currently licensing area development deals as well as franchise agreements for all of Kahala's branded concepts, which includes a variety of good-for-you branded concepts that are in step with today's growing trend towards low-fat, nutritious eating. They include Frullati Cafe, Surf City Squeeze, Ranch 1, Samurai Sam's, Rollerz and Taco Time - all of which deliver strong unit economics, people-pleasing menus and operational ease. Kahala is also offering co-branded opportunities to both existing franchisees as well as new prospects. To learn more about the Great Steak & Potato Company food franchise opportunity, simply complete the form below.